New Delhi: In his last radio address of 2016, Prime Minister Narendra Modi on Sunday reiterated that demonetisation of high-value currency notes was only the first step in the battle against corruption initiated by his government. Following up on the 8 November move, the government will soon implement the Benami property act to target other forms of illegally accumulated wealth, Modi said. “The law against benami property was passed in 1988 but it never got notified. However, this law will be put to use in the coming days to fight corruption. We have reshaped the laws in benami property Act with strong provisions,” Modi said. Modi stayed on a message he has made central in his election rallies in poll-bound Uttar Pradesh. He took a veiled swipe at his predecessors for failing to act on corruption, and made clear that he was willing to stake the social capital he earned in the 16th general election to walk the talk. After greeting the nation on Christmas and drawing on the preachings of Jesus Christ on the poor, he quickly reverted to his familiar theme of tackling corruption as a precondition to addressing poverty—and in this he emphasised the need to move to a less-cash economy. Significantly, the Prime Minister also renewed his support for reform of electoral funding—a key factor stimulating accumulation of black wealth. According to him, but for the fact that the winter session got washed out due to disruptions by the Opposition, the government would have forced a national debate on this issue in Parliament. “Law is equal for all. Be it any individual or any political party and a discussion on political funding would have happened had there not been continuous disruptions during the session. Even the president and vice-president expressed their concern about the way the parliament was functioning,” he said. Calling the public “agents of change” in the fight against corruption, the Prime Minister lauded the people’s support for demonetisation. “I got feedback about the hardships that people are facing due to the note ban but at the same time people also wrote to me saying that they support this step. All kinds of rumours like rise in salt prices, banning of the Rs2,000 notes were being spread but it didn’t weaken people’s resolve and they fought against those misleading the public. I applaud their spirit and will fight corruption with more stringent steps,” said Modi. According to the PM, the flip flops in the guidelines for demonetisation were based on realtime feedback from the public. “I had said on 8 November that demonetisation is an extraordinary fight against corruption. We receive regular feedback from people so that we know which rule is causing a problem to people. Being a sensitive government we changed demonetisation rules based on the public’s feedback,” Modi said. Alluding to the government’s push to a less-cash economy, Modi said his government was launching two lottery-based initiatives to incentivise people to switch to digital and electronic payments. “Today there is curiosity among people as to how can one go cashless. Awareness towards online payments and using technology for economic transactions is increasing. 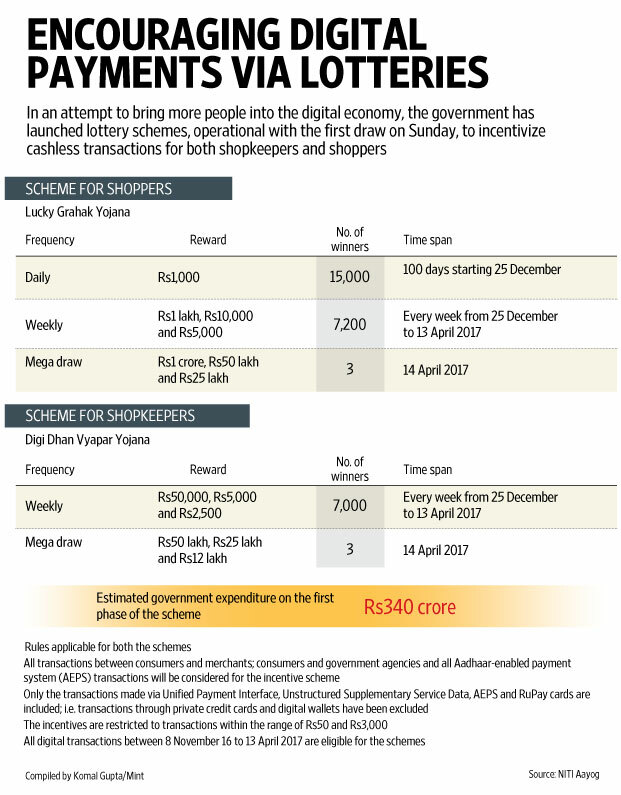 The government has launched two schemes for consumers called ‘Lucky Grahak Yojana’ and for small traders called ‘Digi Dhan Vyapar Yojana. As a Christmas gift,15,000 lucky winners will get Rs 1,000 each and the scheme will continue for 100 days from today. The bumper draw with rewards in crores will be held on April 14, the birth anniversary of Baba Saheb Ambedkar,” he said. Modi said that the scheme is meant to benefit poor and lower income groups as only transactions between Rs50 and Rs3,000 will be rewarded. “Out of 30 crore Rupay Cards, 20 crore belong to poor families.These 30 crore people can join this rewards scheme,” he said. The PM also underlined the positive structural fallout of the move to a less-cash economy—it was absorbing the informal into the formal economy and also eliminating middlemen. “Informal sector is very significant in our country and they receive wages in cash and are often even exploited. But with the new move, money will directly go in their accounts. Businessmen who make use of digital payments will also receive income tax benefits,” he said.